The Bellhops are Australia’s Premier Award Winning Rockin’ Blues, Jump’n’Jive and Swing exponents and have released three critically acclaimed albums. The Bellhops 6 piece lineup features the virtuoso guitar skills of John Russell, vocalist Ian Dittman and rockin’ rhythm Section of Kevin Egan and Mark Roulston with a rip snorting brass section of tenor and baritone saxophone from Ed Schots and James Ryan. The main musical influences of The Bellhops are the Swing and Jive era of the late 40’s, the Rock’n’Roll of the 50’s, the Soul and R&B of the 60’s and the Blues classics. “The Bellhops were the perfect band for our member’s end of year party. They were entertaining and played just the right music for our crowd. Sarah Maxwell, Events Co-ordinator, Art Gallery Society of New South Wales. 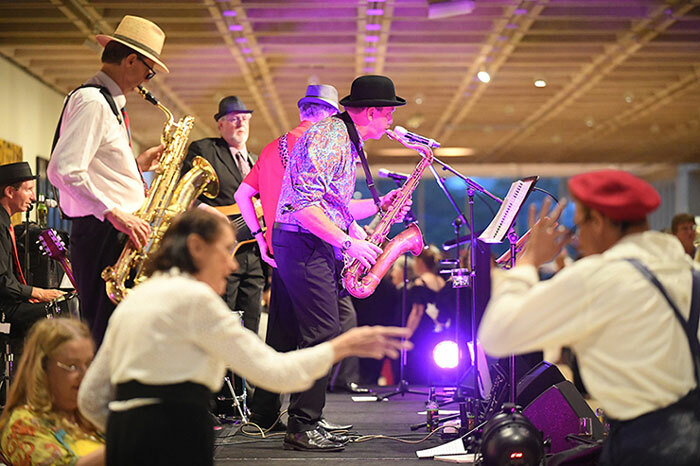 “With thanks to yourself and The Bellhops, I can safely say that our guests at The Anchorage New Year’s Eve Seafarers masked Ball had a fantastic evening. The Bellhops brought with them their own special touch of New Year’s Eve fun that certainly helped make the night the success it was. I found the band to be thoroughly professional, their music was fabulous and what’s more they obviously enjoyed themselves. Indeed, I think the fun they had was contagious as even the staff working on the evening said they had a great time. Kristine Mcintyre, Public relations Co-ordinator, The Anchorage Port Stephens. “On behalf on the Resident Medical Officers’ Association of the Royal Prince Alfred Hospital, I would like to convey our thanks to you and your organization for arranging The Bellhops to play at our Hospital Ball. The Ball was an outstanding success and the band was superb in their ability to fill the dance floor and show people a fabulous time. Dd. Soji Swaraj, President, RMO’s Association, RPA Hospital.